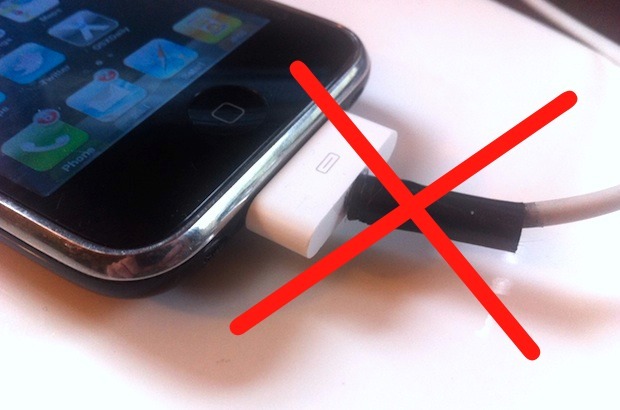 Have a fraying iPhone or iPod USB sync cable? Welcome to the frayed cable club. Now, you have a few choices if you’re floating the boat of cable frays: try to get Apple to replace it for free at about a 40% success rate, shell out $29.99 for an official cable, jury rig a hideous repair by slapping on some electrical or duct tape, or roll the dice with $1 and get a brand new knock-off replacement. Obviously the best approach is to get a replacement from Apple, but they typically only replace these cables if they fray within the first year of a devices ownership. You may have better success at the Genius Bar, but for me going to the Apple Store isn’t convenient anyway, and something about paying $29.99 for a couple wires wrapped in rubber rubs me the wrong way. Initially I just globbed some electrical tape on the portion of the fraying cable, but within a few days it attracted more cat hair than a velvet suit at a vet clinic and about a week later I think it developed a pulse and started trying to communicate with me, plus lets face it, it looks like crap. Enter the great $1 Amazon cable gamble ! For the whopping price of a buck with free shipping included, you can order a cheapo knock-off cable from Amazon, and about 85% of the time the cable is great and works perfectly. The other 15% of the time the cable may not work that well or it looks so janky you’ll be embarrassed to be seen with it in public. Nonetheless, those odds are better than Vegas, so if you’re up for some adventure, shell out a dollar and cross your fingers to get a knock-off cord replacement at a fraction of the price of the official iOS device syncing cable. We’re throwing this out there because these cheap replacement cords have worked for ourselves and friends on multiple occasions, but we’ve also got a dud before. Accept that little caveat beforehand, because your $1 may or may not be well spent, it ultimately depends on where the cable ships from. Buying from iKingshop, VVT, or Importer520 all have very favorable ratings, but as you can see from some of the other Amazon ratings there are a few sellers that ship you rubbish for a dollar. Good luck! What to do with Frayed Lightning Cables? A Broken iPhone Charger: Fix it? Replace it? I got a cheapy cable for about $5 from a local electronics merchant and it does the job just fine. Cable replacement is another great selling feature of AppleCare! Apple replaces worn cables all the time under my iPad or iPhone policy. It’s just a smart investment. I have always used the cables from MonoPrice. Any length from stock to 10′ and cost less than $10. I love having the logo on everything but I go through the stock cables faster than I can get myself to shell out $30. I got one of these $1 cables from Amazon a while back and it works, no complaints here. I have one iPhone 3G with the original cable. When it started break, the rubber detaching from the ‘plug’ and wires showing, I super glued it. I bought a beautiful 10 footer last year for $8 and it was delivered quickly. Probably from the same factory that makes the original. It is very well made and looks like original equipment. Why struggle with a short cord? Less reason for fraying in the first place. After reading this news spot today I checked the same seller and bought 2 more for a TOTAL price of $9.72 including shipping. I’m amazed. I really wonder what you guys are doing to your cables. Funny, the cable in the photo above looks exactly like my frayed cable. I now have two frayed cables, one from my old iPod Touch 2G and the other from my iPad2. My third cable included with the iPhone 4S is still good but that’s because I rarely use it. I bought a knock-off replacement for about $1 as well from a local store and it works just as good. Cool post though, makes me feel like I’m not alone in this world.